Flu is a respiratory illness caused by the flu virus.Symptoms of the illness include fever, sore throat, headache, cough, chills and more. 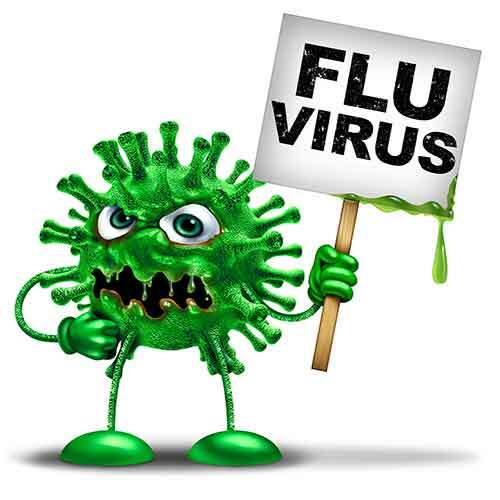 Flu is a common respiratory illness caused by the flu virus. It can cause mild to severe illness and usually comes on suddenly, sometimes without warning. Most people experiencing the illness will usually recover in two weeks or less. Flu is different from the common cold. While a cold is a mild respiratory illness and its symptoms can make you feel bad for a few days, flu is much more serious. It can make you feel ill for a few days to a week or longer, and it can lead to serious health issues like pneumonia. Flu symptoms can be severe and usually come on suddenly. Most symptoms will gradually improve in two to five days but it is not unusual to feel rundown for a week or longer. Below are a few common symptoms of flu. One common complication is pneumonia, especially in the elderly, young or those with lung or heart problems. Another complication is a fever that returns after it has been gone for a day or two. Flu infection of the respiratory tract can also lead to sepsis – the body’s response to life-threatening infections. SignatureCare Emergency Center has 24-hour emergency rooms throughout Texas including many locations in Houston as well as in Austin, Midland, Odessa, Paris, Texarkana, Killeen, College Station, Stafford and Mission Bend/Sugar Land.